I am a huge advocate of salads like this. They are simple to prepare in large quantities and store in the refrigerator for a hearty lunch or easy snacking throughout the week. Eat atop a bed of greens, with pita chips or on a sandwich and you have easily created a balanced meal. It can also be set out next to the cheese plate as a dip at your next party. Making a chickpea salad with curry seems like a bold move, but the taste far exceeded my expectations! In a small bowl, combine hummus with lemon juice, and seasonings. Stir until combined. In a medium mixing bowl roughly mash the chickpeas with the back of a fork or potato masher. Leave some whole chickpeas. 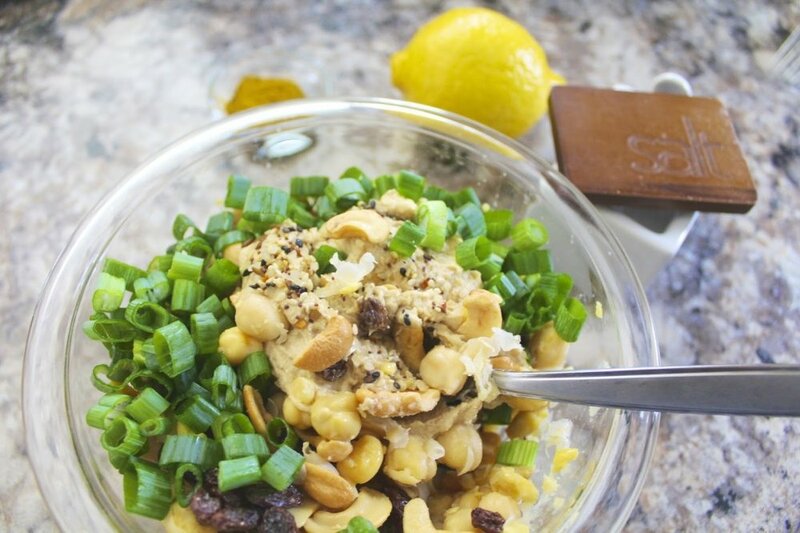 Add in the green onions, raisins, cashews and hummus mix to the bowl and stir until combined. Add salt and pepper to taste. Serve with pita chips, crackers, greens, in wrap, or on a sandwich.